In a time when many schools are encouraging students to bring their own devices or have laptops available for students, it is increasingly convenient to ask students to use online resources rather than purchase expensive anthologies. My school is a 1:1 laptop school, which means all students and faculty are issued a laptop. Many of our English courses have dropped their chunky anthologies in favor of online resources that belong in the public domain or pay royalties to writers, such as Poetry Foundation and The Academy of American Poets’ site Poets.org. Teachers often print literature from websites so that students can annotate, but printing becomes problematic in a time when we must conserve paper either for budgetary or sustainability purposes. 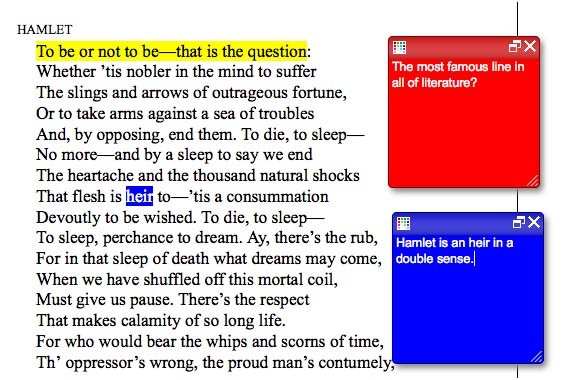 When I worked with teachers at the Teaching Shakespeare Institute this summer, I introduced them to an online annotation tool called Scrible. Scrible allows you to annotate any website and even share those annotations with others, making it much easier for teachers who in the past have collected students’ books to check for annotations. In order to use it, you and your students create accounts and install the toolbar. Instructions are provided at sign-up. It’s easy to toggle on the toolbar and use Scrible to take notes on any page. In the screenshot below, you can see an example of Scrible annotations using the Folger Digital Text of Hamlet. Mousing over the annotations allows you to see what is being annotated. Scrible also allows for color coding, highlighting, and many other annotation tools, including a citation generator that integrates with EasyBib. Students can annotate a sonnet or scene from Shakespeare using Folger Digital Texts. One caveat: the Scrible toolbar does not work in frames, so you will need to grab the text alone. You can either search for the play title (e.g. 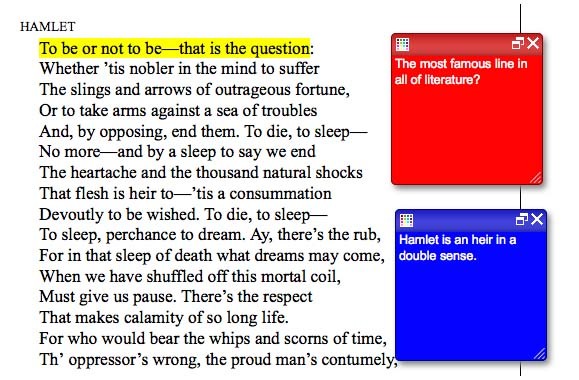 Google “Hamlet Folger Digital Texts”), or you can open the play by right-clicking on the play inside the navigation frame and looking for an option for viewing only the frame that contains the play. Scrible is only one of many tools that can be used to annotate online texts. Teaching Shakespeare Institute participant Dan Bruno shared a great tool called Annotary, and many teachers have been using the social bookmarking service Diigo to annotate as well. What are your favorite online annotation tools? Dana Huff is the English Department Chair at Worcester Academy in Worcester, MA, and has a master’s degree in Instructional Technology from Virginia Tech. She served as a Humanities/Technology Specialist for the Folger’s 2014 Teaching Shakespeare Institute. You can find more of her writing at huffenglish.com, where she blogs about English education and technology. Great blog, thanks for the tips! Carnegie Mellon’s ClassroomSalon.org is another way to allow “shared” collaborative annotating/comments.